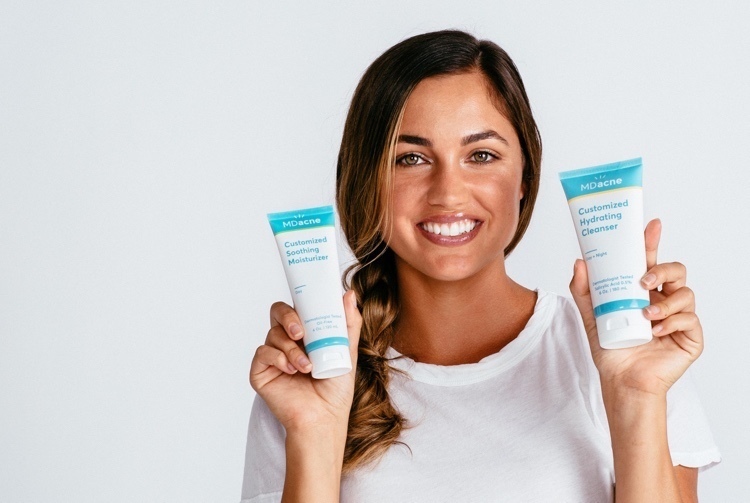 Choosing the right cleanser for your skin type and acne severity is super important, but once you have the right products, you have to use them correctly, too. Have your MDacne customized kit and ready to go? Here are five tips for cleansing your face the right way. Too much cleansing’s bad both for dry skin and oily skin. If you have dry skin, over-washing can make it too dry. If you have oily skin, over-washing can cause over-stimulation and increase the secretion of fat. In any case, no matter what skin type you have, you should always wash your face twice a day. More product doesn’t = better results. Once you have the right cleanser for your skin type, we recommend you use a small amount (No more than the size of a small green pea). You can dilute your cleanser with water in the palm of your hand before you apply it to the skin! Using cleansers with alcohol in them will result in a nice, tight feeling on your skin. Sounds good, right? No! Avoid alcohol-based cleansers. Regular use of these types of cleansers will cause the skin to be too dry, scaly and sometimes itchy and covered fine scales. Scrubbing and rubbing the skin will dry and irritate your face, which can cause an even more intense acne breakout. Always be really gentle with your skin! It’s important to wash your face, but it’s also important to rinse your face thoroughly after washing it! Make sure to splash water on all parts of your face to remove ALL of your anti-acne cleanser each time you wash your face.